I followed directions from a lot of strangers, got in a van, and was dropped off with a key from the 1800’s. So, the adventure started with me boarding a flight from Minneapolis to Atlanta and then on to Rome. All my flights went really well! My final flight was actually filled with students all going to Rome for the semester. I sat next to a girl from Notre Dame who would be taking one class at JCU. We both enjoyed a cup of red wine and chatted about study abroad, packing struggles, and enjoyed talking to our favorite flight attendant too. After we landed we got through customs together before going our separate ways since we were in different programs. I had my SAI luggage tag on my backpack and two girls approached me at baggage claim saying they were in the same program. 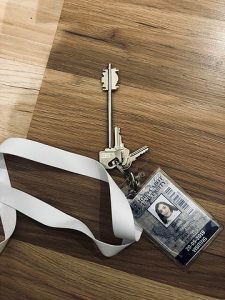 Apartment keys and my John Cabot University I.D. I also wanted to show off my Visa photo taken at Walgreens. We made it to the SAI hotel conference room after walking for about 15 minutes with a semester worth of luggage. Everyone was excited to introduce themselves and chat. Then the SAI leader handed us a key and told us to load into a van. We piled ourselves and our luggage in a big white van and ventured into the Rome for the first time. The drive was crazy! At one point we were driving on the metro tracks but I was too tired to really panic about that. Then eventually the driver told me it was my street. He took out my luggage and pointed at a door and drove away. So, that was terrifying. I could not, for the life of me, figure out how to open the door to my apartment building. Thankfully an English couple walked out and basically saved my life. From there, I hauled my luggage up several flights of stairs because I forgot they label floors differently in Italy. So, floor 2.5 thats right, 2.5 was further away than anticipated. I finally found my door after a lot of sweat but no tears. The key from the 1800’s was up. After a healthy 10 minutes of trying to understand the key I finally opened the door to my Italian apartment. I’ve never felt to relieved in my life. I was the first roommate to arrive so I picked the biggest room, got the best bathroom, and took a long nap. I earned it. Should be smooth sailing from here, right? For more of Claire’s travels, you can follow her on her blog here.